In Part 2 of this longform series by BL, we continue building an objective view of cities in the hunt for Amazon HQ2 in search of clues to the strength of the hands they’re playing to win Amazon’s new headquarters—and the implications for all future site selections to come. 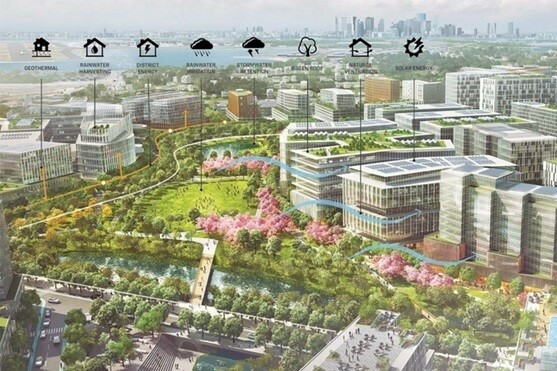 Seemingly never missing an opportunity to disrupt the old way of doing something, Amazon made a big splash in the economic development world last year by releasing its open Request for Proposal calling for responses from cities willing and able to site its supra-scaled 33 building, 55,000 employee corporate campus: HQ2. In the first article in this series, we surveyed the background setting up Amazon’s groundbreaking RFP, general RFP practice and began exploring the path this very public HQ2 RFP process provides as a case study for economic development success going forward. A refresher course is useful at this moment of flux because major macroeconomic structural adjustments, demand shifts, and technological innovations have put the old way of doing things behind us—discussed in greater detail in the last article. Suffice it to say, with almost two decades of the 21st century in the books, we’re forging a higher and better path forward into a brighter future. The summer’s heat this year was as hot as this economic cycle, now one of the longest expansions ever and threatening to overheat. Stock markets, corporate profits, retail sales and industrial production all hover at all-time highs, until discovering an air pocket downward in recent days. Unemployment is at generational lows, underemployment is falling and even crime rates hover at all-time lows. Emblematic of recent disruptive change, Amazon is blazing the trail into this brighter future, sometimes single-handedly it seems. And at amazing scale. Jeff Bezos’ bookselling baby has grown up and in doing so helped push the internet well past the tipping point. Amazon has come full circle by pivoting towards building a massive physical retailing and logistics ecosystem. Through the power of clicks, Amazon is now acquiring bricks. It’s blockbuster purchase of Whole Foods was the largest acquisition in Amazon history—folding in a disruptive category leader that originally had plans for ~1,000 more stores. If Amazon is picking for warmer weather, southern hospitality and a plethora of suburban neighborhoods with diverse housing stock, then Austin, Texas might fit the bill. And Austin may have an edge on Atlanta for cultural simpatico. Like Atlanta, Austin offers affordable housing and living options. The median home value in Austin is ~$325,700, so not quite as affordable as Atlanta but still cheaper than the coasts. High home prices are a sign of Austin’s booming economy. Its population has been booming too. The Census Bureau’s 2016 estimate put Austin’s population at 947,890. So, it’s probably time to stop thinking of it as a second fiddle city. After all, it made Amazon HQ2’s top 20 list. Austin is the economic, educational and cultural center of the Austin–Round Rock metropolitan area, which the same 2016 Census estimates pegged at 2,056,405. It is now the 11th-most populous city in the U.S., the 4th most populous city in Texas and the 2nd largest state capital after Phoenix. And even after so much development, Austin is still the fastest growing city in the U.S. For that success, Austin belongs on Amazon’s list. For its abundance of amenity, quality of place(s) and depth of talent, Austin is playing for HQ2 with some aces. With success come growing pains. In Austin’s case, growing up into a big city brought big urban challenges. As people with higher education and high incomes came flooding into Austin, developers responded by building more and more homes, but prices are still rising. According to Zillow, home values in Austin were up 8.2% last year. The median list price per square foot in Austin is $213, which is higher than the Austin Metro average of $152. Concerns that Austin is too small or unaffordable were allayed, however, when Zillow’s study of HQ2’s effect on rents placed Austin in the middle of the pack of the contenders. If HQ2 comes to Austin, it’s likely to only produce an 8-basis point bump on rents. Still, affordability is a growing concern, especially in Austin’s next phase of growth and the city is working on it. In 2016, the Austin City Council approved a 100+ page South Central Waterfront vision framework plan. 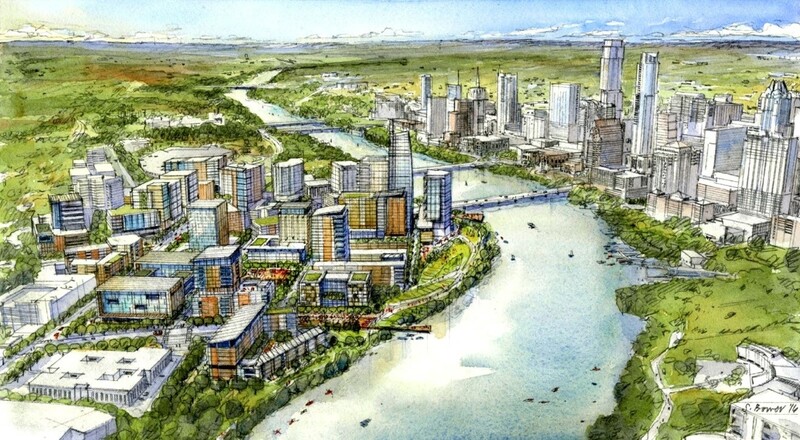 It plans a comprehensive roadmap for how to maximize the redevelopment of the south shore of Lady Bird Lake—a large, pivotal piece of Austin’s urban fabric. It would add 20 acres of open space with new trails, bridges and bike lanes in addition to the amenities there already (the image at the top of this article is taken from a trail on the south shore). And, in the same meeting, council members also voted to increase the South Central Waterfront affordable housing goal to 20%. On the other side of the housing scale, Austin’s research and tech sectors are leading the city’s boom. Austin offices are occupied by ‘Who’s Who’ of the tech world, including Apple, Google, Facebook, Microsoft and Samsung. They’ve come to harvest the intellectual capital produced in Austin’s immediate orbit. There are 425,000 college students in Austin’s region, according to the Austin Chamber of Commerce. So, in the burgeoning war for talented brains, Austin is already overperforming. Austin ranked 13th among U.S. cities for net brain gain in recent years, according CBRE’s Scoring Tech Talent in North America 2017. Tech degrees awarded in Austin between 2011 and 2015 numbered only 9,660 (compared to Atlanta’s 22,634), but tech jobs added in Austin between 2012 and 2016, however, jumped by 15,170. Thus, CBRE calculated Austin’s net brain gain to be 5,510—beating out many much larger cities with brain gains (e.g. Chicago’s +4,281) and brain drains (e.g. Boston (-19,610) and Washington DC (-16,353)). And Austin fared well in CBRE’s 2018 report, ranked 14th for net brain gain. Like its real estate market, Austin’s labor market is showing signs of constraint. Stories of bidding wars for big brains are as common as those on residential listings in recent years. But the same is true in Silicon Valley too, albeit at a much larger scale. So, the takeaway is positive: Austin is an attractive talent engine and will provide a strong base for recruiting. The Greater Austin Chamber of Commerce submitted 40 to 50 potential sites in its proposal for the Amazon project, though most have shortcomings. “No site checks every box they’re looking for, but there are definitely a lot that check a lot of boxes,” said Sam Tenenbaum, market economist with CoStar Group, a commercial real estate data and analytics firm. Austin has suitable sites across the five-county Central Texas region, including downtown and Austin’s tech triangle. 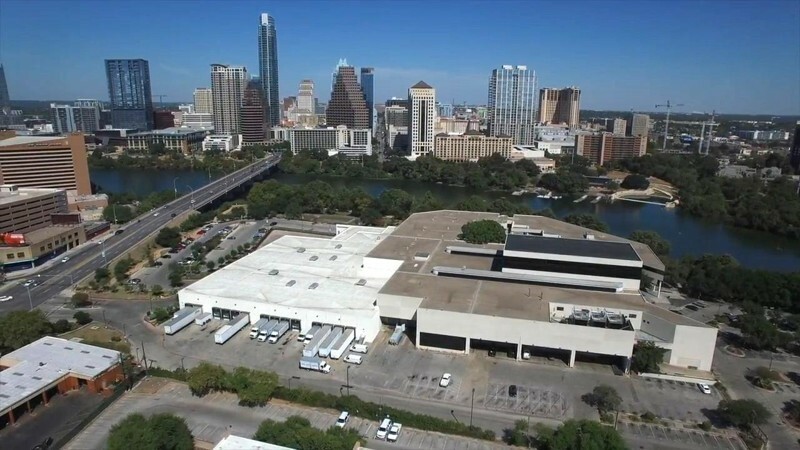 Numerous corporate campuses are in the Domain, which is a large scale mixed-use project seen as Austin’s second downtown where Amazon already has nearly a thousand employees. JLL’s Ryan Bohls believes the 66-acre Broadmoor campus (next to the Domain) is a top option, along with Motorola’s former 100-plus acre campus in East Austin and the 79-acre Project Catalyst in Southeast Austin. “With Oracle’s new campus (nearby)…and relative proximity to the airport, (Project Catalyst) could be a natural fit for Amazon’s HQ2,” said Sam Tenenbaum, market economist with CoStar Group. Photo: Austin American-Statesman building. Potentially dovetailing with Austin’s priorities for affordable housing and amenity development on the south shore of Lady Bird Lake, is the 19-acre American-Statesman property. It’s an urban redevelopment opportunity with supreme walkability that will become increasingly rare in Austin’s near future. The city council recently passed a well-developed plan to redevelop the waterfront area, as noted above, and HQ2 could push the entire neighborhood to its maximum potential. While a bit small, there are other parcels on the waterfront and the surrounding neighborhood that could be assembled. Although assembly could slow the development timeline down and make it harder to meet Amazon’s 2019 target start date. And traffic to such a near in site will require careful planning and cooperation to minimize the impact on Austin’s congestion. Still, the former American-Statesman property presents a unique opportunity to redevelop a large footprint in Austin’s urbanscape. Photo: View over the Austin American-Statesman property. Austin the Cultural Capital > Austin the State Capital? Like Nashville’s Grand Ole Opry concerts broadcast in the 1920’s, Austin City Limits showcased live music, but the music of Texas with western swing, Texas blues, Tejano music, progressive country. Eventually even Rock & Roll. And like the city itself, the show grew in new and interesting ways. Austin City Limits now regularly features regional, national and international artists performing a wide range of musical styles, especially jazz, alternative country, alternative rock, folk music, and many jam bands. The city’s culture and lifestyle are often compared to the west coast. Austin’s up-and-coming tech scene and liberal, laidback vibes should appeal to some of Amazon’s Seattle people. Its startup scene is growing too. And like Washington state, Texas has no income tax. Beyond cultural similarities, Amazon already has actual ties to Austin. Whole Foods is based in Austin. Texas is also where Amazon CEO Jeff Bezos spent part of his childhood growing up and has family. Today he owns more than 150,000 acres in the western tip of Texas. Like Seattle, Austin has a robust adventure scene. It might be the unofficial cycling capital of the world, thanks in part to local rider Lance Armstrong. Pedestrian-oriented development and bicycle infrastructure is ubiquitous and in wide use by the populace. 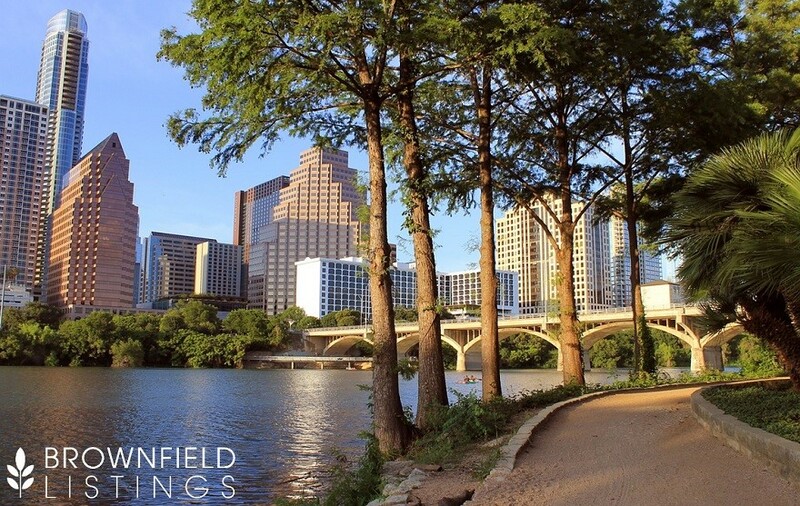 Daytrips to a diverse, abundant array of nearby parks, forests, preserves, rivers and lakes—plus an abundance of trails, river walks and built recreational opportunities—are a central element of Austin’s culture and wellspring of its high quality of life. There’s no Mount Rainier nearby, but Austin is nestled in one of the prettiest parts of Texas with extremely diverse and ranging topography. It sits on the eastern edge of the famed foothills of the Texas Hill Country—a natural geographic crossroads of west, central and south Texas. It’s known as the beginning or end of the American Southwest, depending on whether one is coming or going. The Texas Hill Country contains some of the most beautiful and adventurous geography found anywhere. It stretches over an area larger than Massachusetts with more than 8,000 square miles of rolling hills, winding rivers, fresh springs, waterfalls and picture-perfect scenery. The region’s air is relatively dry and, together with its thin topsoil, is prone to flash flooding. But plenty of water is also present in Austin’s topographic tapestry, so the area features an abundance of lakes, rivers, and waterways, such as: Lady Bird Lake, Barton Springs, McKinney Falls, the Colorado River and Lake Walter E. Long. The hiking is excellent. Located on the Edwards Plateau, the Austin region is dominated by rugged hills of both granite and limestone rising between 400-500 feet above the surrounding plains and valleys. From the water’s edge, Packsaddle Mountain rises to a height of 800 feet above the Llano River in Kingsland. The Hill Country also features the second-largest granite dome in the United States, Enchanted Rock. 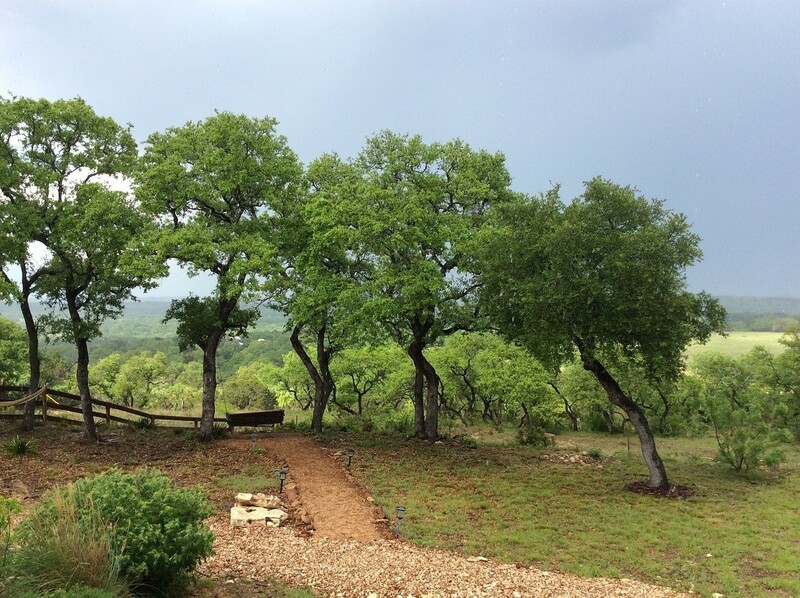 Microclimates vary dramatically depending on where you might be standing in a given valley of the Hill Country. So, while arid, Austin is not exactly dry and the natural ecosystem flourishes. There are juniper, ash and oak trees throughout the area with prickly pear cactus, desert spoon, and wildflowers in abundance. Photo: Texas Hill Country near Austin. It’s just the kind of unorthodox style that may attract Amazon. And future generations of Amazon employees. Austin Reaching its Near-Term Limits? For Austin’s many strengths, it has weaknesses too. While public transit is present in Austin, Amazon may be looking for more than a city with just a couple light rail lines. Of even greater concern is the growing propensity for congestion in Austin, as its existing transportation has trouble keeping pace with the population’s robust growth. A study by transportation analytics firm INRIX notes that “commuters getting into Austin spent more time stuck in traffic than anyone else” with its congestion rate a soul crushing 28%. Overall, INRIX puts Austin at 13th worst traffic in the U.S., which is not as bad its HQ2 competitor to the north, Dallas (rated 7th worst). Going into a site selection competition for 33 buildings and 55,000 workers like HQ2, while so growth constrained, must be among Austin’s top concerns. Perhaps just as concerning as growing congestion on the roads, at least from an Amazon C-Suite perspective, is congestion on the runways at Austin–Bergstrom International Airport. Austin–Bergstrom is a Class C international airport—that is, not one of the busiest Class B airports like in nearby Dallas or Houston. It’s the 34th busiest airport by total passengers in the U.S. with counts increasing by 4.5% in 2016—above the previous record year of 2015. The airports first major expansion project—the East Terminal Infill—was completed in the summer of 2015. But it’s already time for Austin-Bergstrom to grow again. More than 4.6 million passengers have traveled through the airport already this year, a ~14% increase over the same period last year. In the summer of 2016, work began on a new 88,000 square feet pier on the east side of the terminal to increase the total number of gates from 25 to 33 spaced farther apart to accommodate larger aircraft. This import expansion is expected to be finished early next year. A new parking garage will be completed in advance of the new gates later this year. And recently Delta selected Austin as a “Focus City”. It likely means more direct flights, larger planes, more marketing locally and a Sky Club lounge in the new terminal that’s under construction. professional sports they do have. 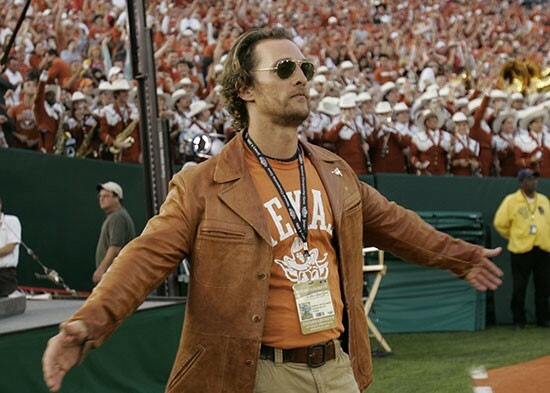 And, of course, Austin is a premier college sports city as the home of The University of Texas at Austin. Like inland Texas’ other finalist, Dallas, Austin makes sense in a world with a changing climate. And if lining up a future pivot to the Southern Hemisphere in the next decades, then many see Dallas, Austin and Miami as top choices. Is Boston the Best Fit for Amazon’s Long-Term Plans? Boston is another objective frontrunner. It’s home to some of the finest institutions of higher learning on Earth, so you would presume Boston checks Amazon’s talent box. 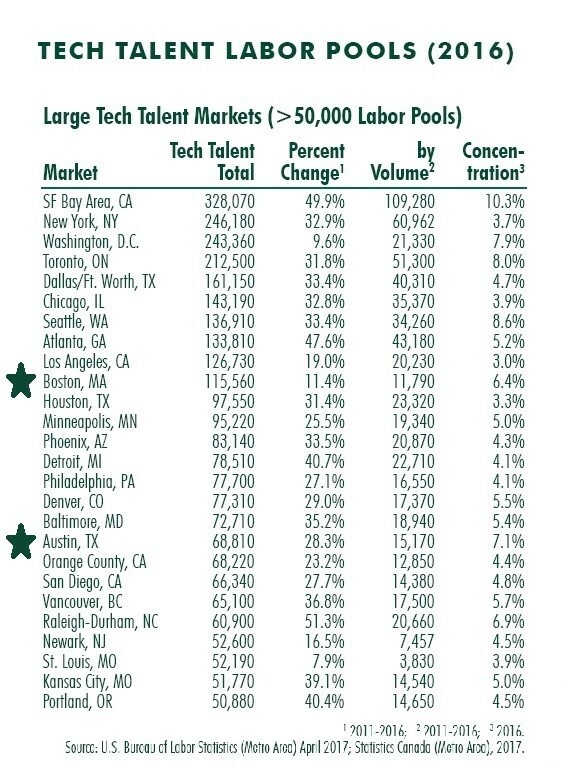 By sheer size, however, Boston’s tech labor pool is actually relatively much smaller than San Francisco (nearly 3X larger), New York and Washington D.C. (both 2X larger). 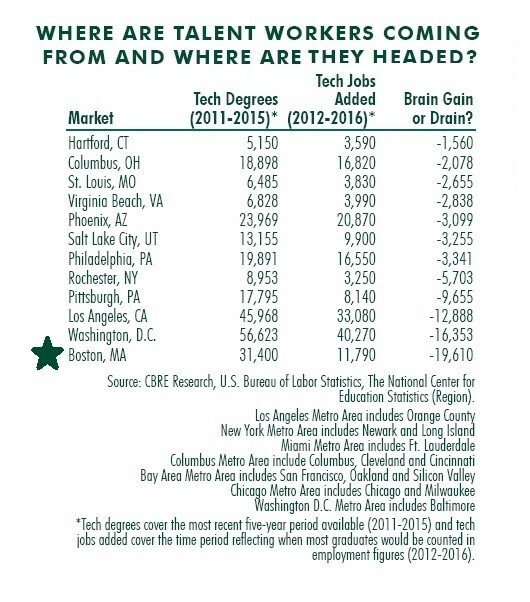 CBRE’s Scoring Tech Talent in North America 2017 also ranked Boston last for “brain drain,” due to the super-concentration of tech degrees produced locally but hired elsewhere. CBRE calculates that 31,400 tech degrees were awarded in Boston between 2011 and 2015 (compared to Atlanta’s 22,634 and Austin’s 9,660), but only 11,790 tech jobs were added—for a net drain of 19,610 tech degrees. In CBRE’s 2018 report, Washington D.C. beat Boston to suffer the biggest net brain drain. If Amazon bets HQ2 on Boston, it’s betting the city can turn that brain drain around. Doing so could be the key to solving Amazon’s talent problem for the century. Boston is Massachusetts’ capital city and its most populous. Its estimated 685,094 inhabitants make it is the largest of any city in the New England region. The City of Boston’s population and commercial density help anchor the wider region, known as Greater Boston. This metropolitan statistical area (MSA) contained an estimated 4.8 million people in 2016, which makes it tenth-largest in the U.S. Boston’s total combined statistical area (CSA), however, clusters 8.2 million people into one commuting region, which is currently estimated to be the sixth-largest. Boston is a global city, still with very real ties to the old world and a business tradition handed down from the bustling commercial port that has thrived as the unofficial capital of the New England region for centuries now. It’s coastal village geography was the secret to the city’s early success. Today, nestled into the area’s ranging and diverse topography, modern Boston’s built-environment consists of tight development patterns, extensive transit network and a large green infrastructure system-with an abundance of squares, open space and waterfront resources. This city-wide system of green space is laced together, in part, by a 7+ mile long park system covering 1,200 acres known as the Emerald Necklace, seen below. Its amenities work with its dense history to give Boston standout charm. And Boston has an old world feel and historical charm absent so many other American cities. Walking the tight and winding streets, sometimes on cobblestone, makes you wonder whether it’s the same stones where America’s forefathers once stepped. As its famous harbor functioned before, today it’s Logan International Airport that connects Boston’s people to the globe. It has the nonstop flights to Seattle any winning bidder will need and a lot of other places. “Logan” is the largest airport in the New England region and 17th-busiest airport in the U.S. with direct flights across multiple continents. Boston’s strategic location at northern latitude gives it excellent coverage over much of its hemisphere by air. So, “Beantown” benefits from relatively short flights to Europe should Amazon be lining up a pivot east. Boston is also a sentimental choice for many Amazon employees. Bloomberg reported early on that Boston was favored by several Amazon executives. The region’s top-notch universities have been producing the business graduates and highly technical engineers that Amazon has been hiring for years. They know they city well. Some love it. And Amazon has several going concerns in Boston already. Its footprint includes a large hub in North Reading, home to acquired robot maker Kiva Systems Inc., which Amazon bought for $775 million in 2012. Bostin is doing well. It recently won new headquarters for GE and iboss Cybersecurity. In January 2016, GE’s corporate HQ move was greased with $150 million in government incentives. So, Boston can make a deal. Although Mayor Marty Walsh has also warned that Boston is “not going to get into a bidding war with another city over something like this.” That’s confidence, but maybe Boston can bet on being the natural fit. Will Boston’s talent, transit and cultural simpatico with Seattle sync for Amazon? Beyond the commercial connectivity and personal affinity for Beantown, Boston shares cultural symmetries with Seattle as major seaports, regional anchors and maritime climates. You’ll find plenty of fresh seafood and water recreation in both coastal ports. As well as an abundance of outdoor recreational opportunities for the adventurous day tripper across New England. Boston’s strong public transportation system is a resilient backbone in the community and an investment that continues paying dividends. Boston’s history of investing in its infrastructure—and going big when necessary, such as the Big Dig, if expensively so—bodes well for the ability of this major coastal city to combat climate change in the decades to come. In the city’s 218-page bid, Boston focused nearly all its attention on its Suffolk Downs site in East Boston—not too far from the water’s edge. Branding itself a proud city of immigrants transformed into a 21st-century global hub, the city of Boston pitched a site in the heart of the U.S. northeast. 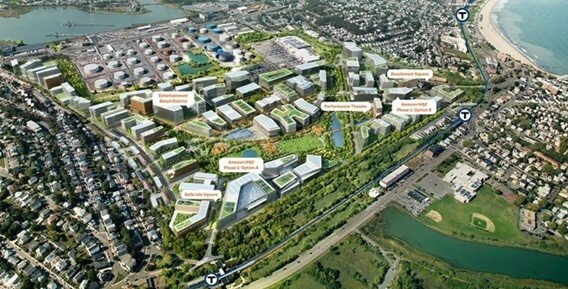 The city’s plan conceives what a fully developed Suffolk Downs Amazon campus would look like by including dozens of office buildings and a sprawling green space to replace the historic race track occupying the site. The plan also includes 10,000 diverse housing units that could theoretically accommodate ~20% of Amazon’s employees on-site or within short walking distance of their offices. “These residential buildings will be interspersed with the commercial buildings ensuring vibrancy throughout the site and creating several new neighborhoods on the site,” according to Boston’s pitch. Boston’s Suffolk Downs concept also plans for four separate retail areas on the site totaling more than 550,000 square feet of storefront retail space, including Beachmont Square, Belle Isle Square next to the Suffolk Downs T Station, a new Main Street Retail District and a more active entertainment district to appeal to Amazon’s cultural affinities. Notably, Boston’s 200+ page bid devotes just six pages on other potential site alternatives, including those in the South Boston Waterfront, the South End/Back Bay area and Allston-Brighton. Is going downtown destined to get on HQ2 Boston’s bad side? But for all Boston’s public transit prowess, its overall transportation system is under stress. Traffic is notoriously terrible in Boston. This year Boston’s traffic was dubbed the nation’s worst, and the sixth worst for motorists only behind Seattle, Washington DC, Detroit, Oakland, and San Francisco. Boston’s traffic was also recently ranked among the worst in the entire world. With gas prices up again, Boston drivers must be wishing they weren’t wasting so much gas in Beantown. INRIX’s report scored Boston 16th worst for traffic with 58 peak hours spent in congestion—which was better than Los Angeles (worst in the world), New York and San Francisco (3rd and 4th worst respectively), Atlanta (8th worst), Miami (10th worst), Washington DC and Dallas (13th and 14th worst). INRIX estimates the extra hours spent in traffic equate to $1,759 per Bostonian in direct and indirect costs. “It just stinks to tour Boston right now,” Grasso said. One of his tour groups recently spent 35 minutes in a coach traveling from Faneuil Hall to the Boston Opera House —a 0.9-mile trip. “You can’t move,” he told the Globe. The Boston Transportation Department is making efforts to reduce congestion. It’s retiming traffic signals, upgrading traffic monitoring and adding real time adjustments via live feed, but today’s technology cannot completely resolve Boston’s geography—although maybe flying taxis and elevated mini-heliports can. This is happening notwithstanding Boston’s stellar five-fingered light rail system. Unfortunately, growth in Boston is busting the roadways of the quaint colonial coastal town. Boston suffers one of the most congested roads in the country. Interstate 93 can snarl the pace of traffic in the region like a clogged artery in a human heart. Suburban Boston is beautiful but fragmented by predominant natural and manmade barriers. Pockets of Boston isolated from its 5 subway lines are much more car-dependent and suffer as a result. According to a study by the Auto Insurance Center, Malden, on Boston’s north side along Interstate 93, endures the 19th worst traffic in the country. Boston is embracing alternative strategies by engaging in campaigns to encourage people not to drive. If HQ2 is too big for downtown Beantown, is there another site in Greater Boston? If downtown Boston is out for gridlock, could the HQ2 campus nestle into one of Greater Boston’s suburban communities? Worcester, the second-largest city in Massachusetts, is offering $500 million in local property tax incentives and a 98-acre campus in the city’s 60-page proposal packet. The three-parcel spot is next to a stop on the MBTA’s “T” line to Boston (currently with 20 daily round trips), 2 miles from Interstate 90 and bisected by Route 20, which the Worchester notes is the “the country’s longest road” extending to Oregon. Worcester is only 40 miles west of Boston, 50 miles east of Springfield and 40 miles north of Providence, Rhode Island. The city also boasts its located within 50 miles of the 135 institutions of higher education, but that’s something many in Massachusetts can claim in their pitches too. Worcester is growing with 923,672 people in the metro area. 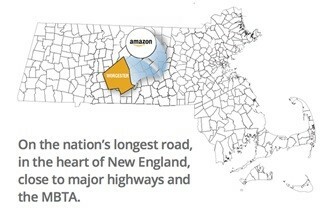 Worcester County itself now counts 800,000 residents—with a regional laborshed draw that easily nudges it over Amazon’s 1 million person minimum. Due to its location in central Massachusetts, Worcester is known as the “Heart of the Commonwealth”, thus, a heart is the official symbol of the city. Worcester was once considered its own distinct region apart from Boston, but since the 1970’s Boston’s growth has pushed further westward. Following the construction of Interstate 495 and Interstate 290, the regional Boston urbanscape quickly subsumed the open lands in between Worcester and the coast. Worcester now forms the western boundary of the Boston-Worcester-Providence CSA—and all its 8,099,575 people. But the city itself is home to a modest 184,045 and a downtown campus for HQ2 would require quite a lift from its level of residential, commercial and civic capacity currently. Worse, while Worcester Regional Airport has daily flights to Florida and New York, as well as a regional shuttle to Cape Cod, it does not have the dedicated flights to Seattle to meet HQ2’s minimum requirement. Worcester’s regular rail service to Boston is a 90-minute trek one way from one end of the line to the other, which puts the real door-to-door time short of ideal for the average business commuter flying through Logan International Airport in Boston harbor. So, the Greater Boston suburbs are disadvantaged against airports nearby potential downtown locations in Atlanta, Austin and Boston’s own Suffolk Downs site. But the Bostonian burbs have a chance because they’re roomy, resilient (being inland and upland) and transit in Greater Boston stretches just far enough. Though the further out you go, the frailer infrastructure becomes. The Bay State ranked 10th worst overall in a recent assessment, with 31.5% of its roads in poor condition (the 2nd highest), 9.3% of its bridges (20th highest), 22.9% of dams at high hazard risk (22nd highest) and highway spending at only 4.5% of the state’s budget (11th lowest in the nation). None of that is good for the 10 other reported bids submitted by different areas in the state. What Worcester and other burbs have, however, is affordable real estate. The average sale price of a single-family home is $234,000 in the Heart of the Commonwealth. The median rent price is only $1,400. Class A office rents go for between $21-$45 per square foot. In its proposal Worcester pointed out to Amazon that, comparatively, ~$575,000 can buy a 2-bedroom, 1-bathroom home in Seattle where the same money will buy you a 5-bedroom, 3-bathroom home in Worcester. That cheaper cost of living means that $30,255 in Worcester goes as far as a salary of $50,000 in Seattle. Worcester points out that, in fact, Worcester is 39% cheaper than Seattle. Worcester’s strength of affordability is urban Boston’s weakness. Boston might have a lower cost of living than some other large urban areas, but its real estate is becoming unaffordable. Zillow takes Boston market temperature as a “hot” and forecasts prices will rise 3.6% this year. The median list price per square foot in Boston was $660 last year, which is much higher than the Boston Metro average of $264—and even higher than Seattle’s $468. The median price of homes currently listed in Boston last year was $719,000—which is also higher than Seattle’s $690,200. The median rent price in Boston is $2,700—almost double the rent in Worcester. 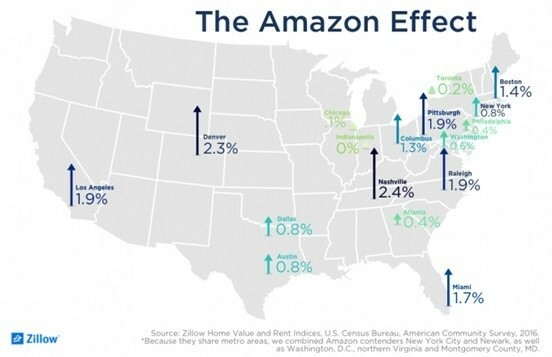 Worse, the impact HQ2 would have on rents in Boston were among the top of the range among contending cities in Zillow’s affordability study. Can Boston stop bleeding all those big, beautiful brains? Is a premier site like Suffolk Downs enough to attract Amazon 3,000 miles to take the plunge alongside the opposite coast? Boston is becoming land scare, so there won’t be too many opportunities of this size in Boston to ever come again. This could be Amazon’s one chance to plant such deep roots into Boston’s rich cultural and cerebral ecosystem. Boston’s educational resource is practically unparalleled. There are few rival hubs of learning on the planet. But, presuming for a moment that Boston can find HQ2 a path for more friction-free growth by ameliorating its congestion and allowing for more affordable housing, the answer to whether Amazon comes, or not, may depend on whether the brilliant minds cultivated in Beantown find more reasons to stay. You might presume that Amazon’s presence in Boston would make it easy to recruit top talent from MIT and Harvard, but this shouldn’t be taken for granted. Boston’s nation-leading brain drain is a perennial and persist issue. Boston experiences below average growth in the millennial segment of its labor pool, 0.8% in CBRE’s 2017 report (although Boston is one of the most millennial-concentrated markets at 24.6%, only behind Madison and Pittsburgh). Boston may be too expensive for young recruits, which would be a problem for a development at Suffolk Downs that will come in at market rates. This could tilt the balance to the value the Greater Boston suburbs can offer. Together, the region might stand a better chance of stemming the flow of brains out of its many fine educational institutions. Local towns have a history of teaming up on big projects, starting with the American Revolution and more recently the war for amenity and race for quality of place, like this 16-community bike share. Such a regional plan isn’t considered in the pages of Boston’s, Worcester’s or any other proposal from Greater Boston. But it may be essential because Amazon strongly desires to avoid the small fish bowl constraint it’s suffering in Seattle. Can Amazon anchor a boom to a medium-sized community in greater Boston’s orbit? Or is this precisely the kind of company town problem Amazon wants to prevent from recurring? It’s a powerful driver, especially in the wake of the recent attempt to levy against large corporations in Seattle, as discussed in the first article in this series. Boston is in the game for HQ2, but can it win? It’s a global player with a unique cultural richness and historical relevance its institutions have leveraged to attract tourists, students and talent from across the country and around the world. If it can show how it plans stop the brain drain and win the war for the next generation of talent, then Amazon might think it’s a safe bet. 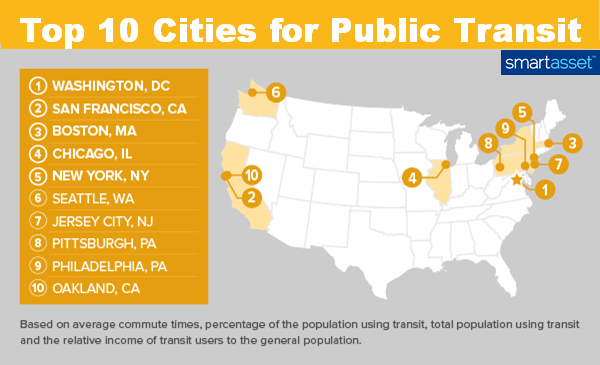 But as much as talent is essential, transit/traffic is critical too. Will Amazon see Boston as too growth-constrained, or see the last big site available at Suffolk Downs as it’s best beachhead to win the century? Could a regional dark horse site with dedicated express trains, between Worcester and Boston for example, be the big idea that unlocks Greater Boston’s potential? Or a hyperloop bullet train, like the one Elon Musk just agreed to build underground between downtown Chicago and O’Hare airport? Greater Boston can strongly check every box on the HQ2 checklist. If Amazon can see solutions through its potential barriers to growth, then it has a better chance than most. In the next issue in this series, we’ll examine Chicago more closely as well as another top Amazon contender. We’ll also begin separating the contenders we’ve seen so far from the pretenders who don’t quite have what it takes—yet—and start eliminating cities from contention.